Forty years ago almost all cucumbers grown north of Watford by amateur gardeners were of the greenhouse type. 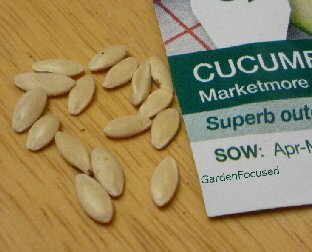 In recent years cucumber seeds have been developed which are more than happy to produce excellent crops when grown outside in much of the UK. Often this type of cucumber was referred to as a ridge cucumber because they were grown in mounds of soil designed to capture warmth, sunshine and provide good drainage. This is still an excellent method of growing them and it takes very little effort. They can however now be grown successfully on flat vegetable beds or raised beds. 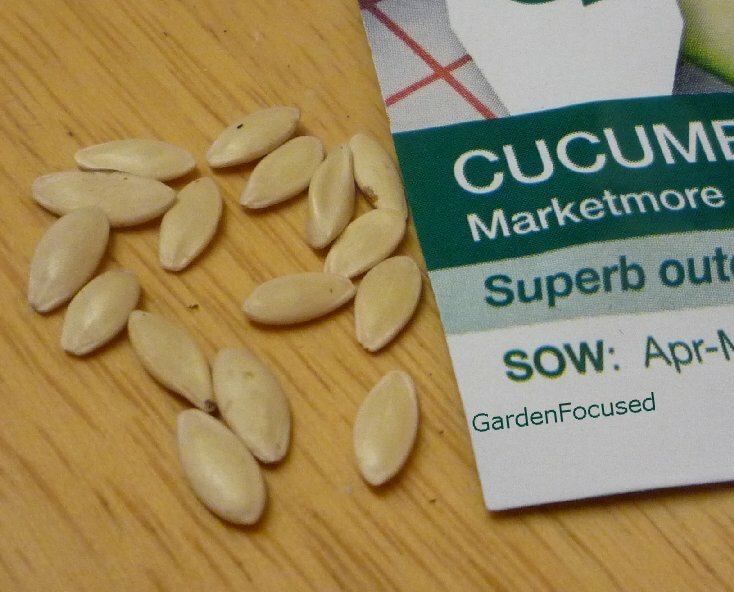 When you buy your cucumber seeds they will be classified as one of two types based on how early they can be sown in the year combined with how long they take to be ready for harvest. These are classically grown varieties such as Bella and Pyralis. These varieties are only suitable for growing in warm temperatures such as those provided by a greenhouse. They tend to be longer than outdoor cucumbers. All greenhouse cucumbers will require frequent manual watering often as much as once a day. If you enjoy a summer holiday and don't have a trusted friend to look after your cucumbers daily while you are away then forget about growing this type of cucumber. Over the last 40 years or so excellent varieties of cucumbers have been developed for growing outside directly in the soil. These are sometimes called ridge cucumbers. Well known varieties include Marketmore. Many outdoor ridge cucumbers have small bumps on them although not all as La Diva proves. The debate as to which type of cucumber tastes best, outdoor or greenhouse grown, will go on for ever but in blind tastings both came out about the same - see this Daily Telegraph article for informal tasting results of both types. Come back here though after reading it, for the ultimate guide on growing the tastiest outdoor cucumbers. A position in full sun is the best one for ridge cucumbers, they will grow in partial shade but not as well. 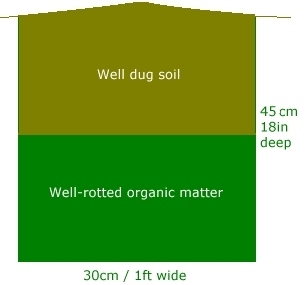 As far as soil is concerned they do best in a neutral soil (neither acidic not alkaline) but they grow well in most soils as long as it's prepared well. The soil should be rich in nutrients, well drained but at the same time retain water - that's said for for a lot of vegetables but for ridge cucumbers it's more important compared to normal. They need water to bulk out the cucumbers but the plants and fruit suffer from mildew sometimes so the soil should also drain well to keep excess water away. As far as crop rotation is concerned, ridge cucumbers can be grown anywhere in the garden or allotment. It's best not to grow them in the same position every year but they really don't encourage soil pests or diseases. We describe below the classic way to prepare the soil for ridge cucumbers which may not always be possible but try to achieve as much as possible with the aim of having a rich, free-draining and water retentive soil. Where the ridge cucumbers are to be planted dig out a trench which is 30cm / 1ft wide and about 45cm / 18in deep. Fill the trench half full with well rotted organic matter (from the compost heap is ideal) and then pile the earth on top. The weight of the earth will compact the organic matter but you will still be left with a ridge over the trench. This is now the ideal soil for growing ridge cucumbers. See the picture below for the basic idea in a picture. 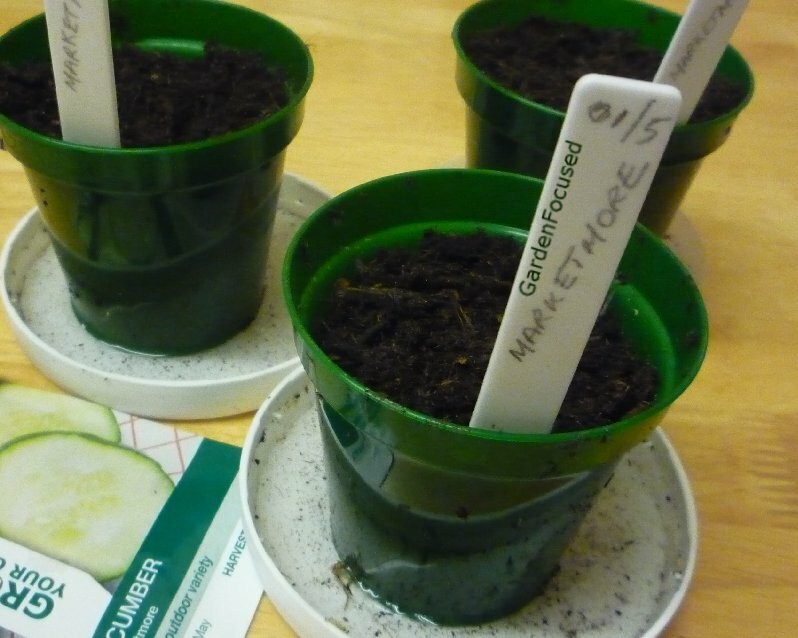 Except in very warm parts of the UK the best method for sowing ridge cucumber seed is in pots, indoors. The best time to do this is in the third week of April. If you really want to sow seed directly outside see our calendar near the top of this page for dates. Ridge cucumbers are very productive if grown well, three to four plants will provide more than enough for a family of five. When planning how many seed to sow also take into account that a fully grown plant can easily take up 60 centimetres square (2 feet square). 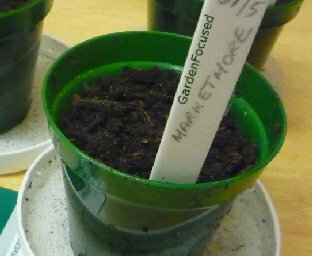 During the third week of April fill a 10cm / 4in pot with normal potting compost to within 2cm of the top. Place one or two ridge cucumber seeds on the compost and cover with 1cm more potting compost and pat it down gently. Water with a fine spray to settle the compost down. Mark up with the variety name and place in a warmish, dark place (around 20°C / 68°F). The seedlings will sprout above the surface after about 8 days and at this stage place the pots in a light position with a minimum temperature of 15°C / 60°F. Avoid placing the seedlings in direct sunshine because this may well damage their delicate foliage. 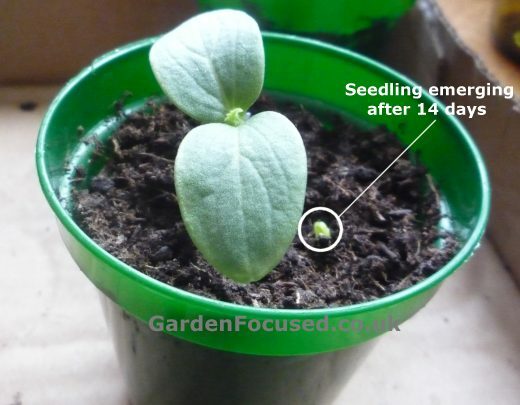 The cucumber seedling shown above is exactly two weeks after sowing the seeds indoors. You will note that we have highlighted a seedling which has only just appeared after that time. So although they normally appear after a week or so, wait for three weeks if nothing grows initially. Ridge cucumbers can only be transferred to their final growing position when all danger of frost has passed. But first they need to be hardened off and acclimatised to conditions in the open. Begin to harden them off in the third week of May and then plant them out in the first week of June. Planting them in their final position involves digging a hole slightly bigger than the pot, turn the plant out of the pot, place in the hole and fill in with earth. Water well to settle the soil down.